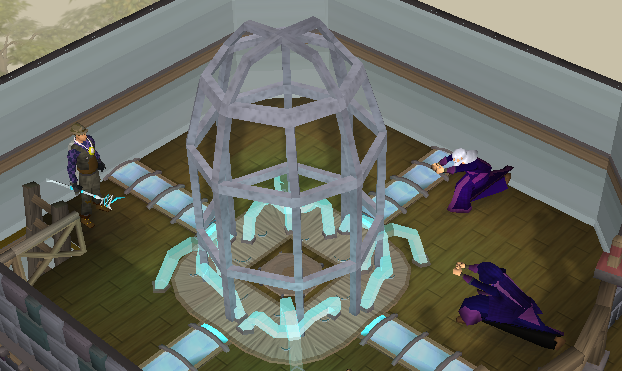 Begin by speaking to Effigy near the tower southeast of East Ardougne. 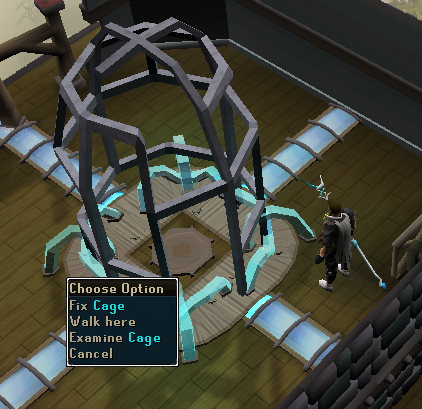 Speak to Effigy south east of Ardougne near the giant tower. He will tell you to speak to Bonafido, he's located just slightly north east. Speak to him, when you ask to enter the tower he will say you don't look like a builder. Then he'll eventually let you in if you have builders gear. Builders gear consists of a Hardhat, a Shirt, a pair of Trousers and Pair Of Boots. You'll have to speak to the various builders around and they all want you to do an errand for the "builders gear". 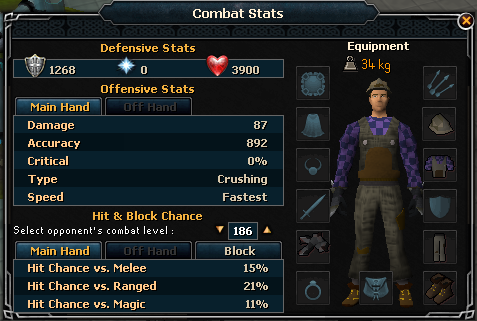 Now speak to 'The Guns' and he'll say he's got a shirt, but needs a cheap beer from Yanille, give him the beer and he'll give you his shirt. To get the boots, speak to 'No Fingers'. Then you can pickpocket him to the boots. If you don't talk to him first you will only get Triangle Sandwiches. For the trousers, speak to 'Gummy', and then search the bushes around the back of the tower. If they are not in there they are in the ones slightly east. Your legs are getting a bit cold. Carry on, it'll fix itself. Go in the tower and search all of the crates that have straw on top for pieces of metal, colored balls and some Binding Fluid. You need 4 Colored Balls, 3 Metal Sheeting and 4 Valve Wheels. 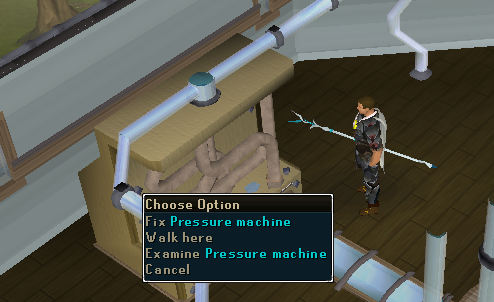 Now go upstairs and you'll find a machine, select the Fix Option. Then you'll fix the machine but it needs calibrating then you'll be stuck with this puzzle. Pull the right lever down and turn the first wheel left until the ball blocks the hole. Then pull the left lever down and the right lever up then turn the second wheel left until the ball blocks the hole. Then turn the third wheel right until there's another leak, then turn it left. 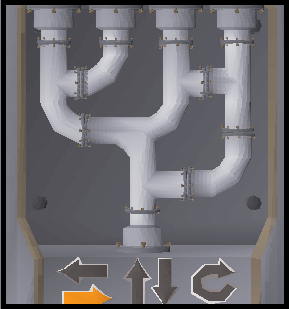 Pull the right lever down and turn the fourth wheel right until a leak appears, then turn it left. Now turn the fourth wheel right three times, turn the right lever up and then turn the third wheel right four times. Turn the second wheel right four times, pull the left lever up and turn the first wheel right five times. 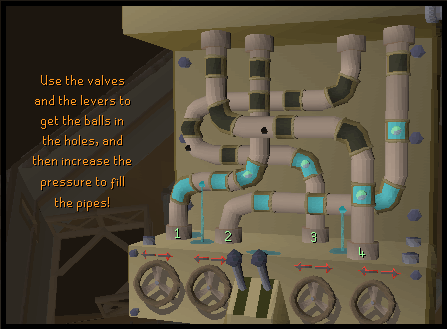 Now you need to go upstairs and do the second puzzle, to fix the machine you need 6 rivets, 4 metal pipes and 5 metal rings. 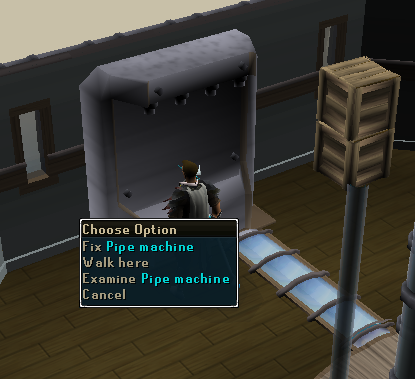 Once you fix the machine, you need to rotate the large one so it's like the one in the picture, then add the others on like so. Now go upstairs to the 3rd floor to find a broken cage, you need 5 Metal Bars and 4 Bottles Of Fluid. 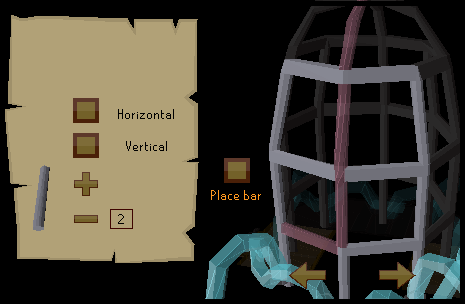 Now you have to place the bars in the right places, use the Horizontal and Vertical to get a Horizontal or Vertical pipe, Use the + and - to increase or decrease the length of the pipe, then click the "Place Bar" option, if it works it will fit onto the cage, each side has different parts missing, there are 4 sides and use the arrows to select the sides. The maximum length is 4. 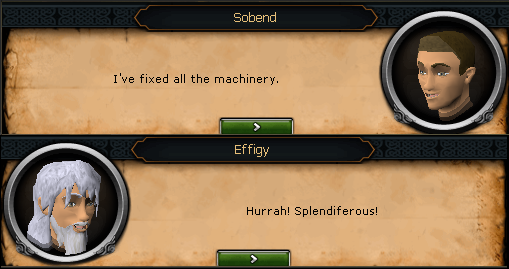 Now go back to Effigy and he's delighted that you've fixed the machinery. He then goes with his two fellow companions to the top of the tower, follow them and make your way to the top. Then they will summon with a ritual a Homunculus. Then it wants to break free and they won't let it, you're outraged. It casts a powerful spell and the alchemists and Effigy run away. Now you need to go back to the bottom floor of the tower and speak with Effigy again. Then Effigy begs you to go to the top of the tower and talk to the Homunculus, you eventually give in, make your way to the top of the tower. It's confused, and it doesn't know whether its mind revolves around logic or magic, answers the questions and the meter at the top of the screen will follow a certain path depending on your answers. Now go back to Effigy and the two alchemists, the homunculus will appear and scare them off, he then tells you to go into the dungeon. 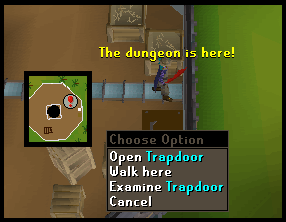 The dungeon is located here. Go north and the Homunculus will be there, he will say this is where the power came from for him to be created, after you finished speaking with him. 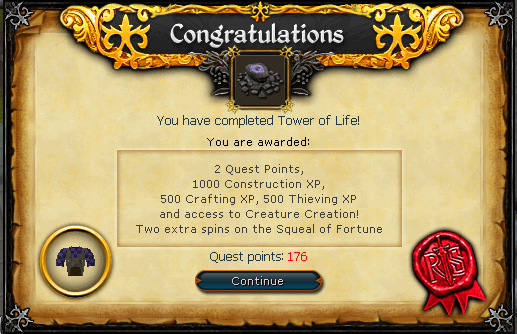 Construction Outfit 1,000 Construction experience 500 Crafting experience 500 Thieving experience Access to Creature Creation. 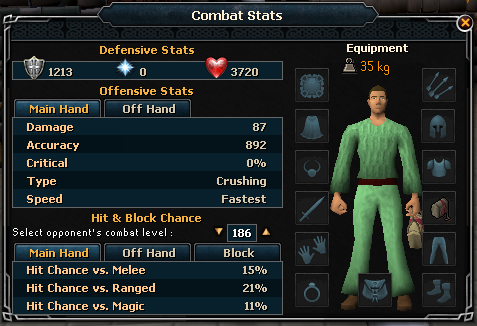 The construction outfit looks like this. It can be stored in your armour case located inside your Player Owned House. 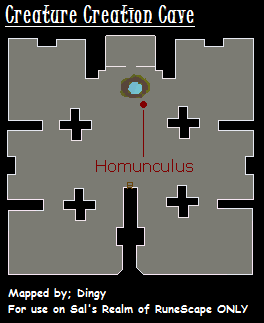 Creature Creation is an Activity in which you collect items in the dungeon and bring them back to the homunculus. He will then create a unique monster for players to fight, and after defeating it, players can receive on or more uncommon items as a drop. Possible drops include Satchels and Tea Flasks, as well as items which were used as an ingredient in creating the creature. Tea Flasks can hold up to five Cups of Tea. To fill a Tea Flask, use a full Cup of Tea on it. Players can drink directly from the Tea Flask, or they may use the flask with an Empty Cup to fill the cup. A full Tea Flask heals 150 Life Points.